It's fixed now. Thanks you. I purchased this addon from your site and when I download it, the .zip file is empty. Is it possible that you uploaded a wrong file for this addon? Would be great if you could look in to it, that I can download this addon - it is much needed. Thank you very much, it works now perfectly! I would suggest adding an option to enable Post Reply in specific forums. I recently purchased the “Anonymous Posting” add-on and am having some issues getting it working. I have configured permissions and analyzed them with the final outcome being “Yes” to use Anonymous Posting in a certain section. However, I see no check-box or area that allows for me to post anonymously? Tried disabling all add-ons except for this one and still had the same issue. Any advice? Thank you very much for the quick fix! That was very fast. It seems that the fix only works when replying to a thread, but the checkbox does not appear when making a thread. truonglv Is there a way to change it so it matches? Zach Let me think about it. Working on new credits add-on! 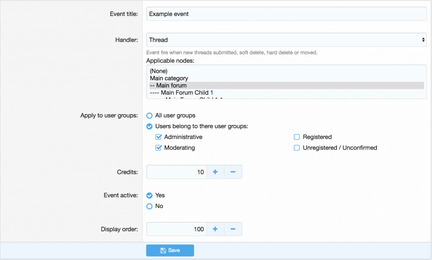 I can't find the event trigger option for thread control actions in attached screenshot. You should add them as checkbox options. WorldGate It's same so yes. [Ignore Content] Confirmation popup for threads. Would it be possible to also add a confirmation popup for the threads? This to prevent users from accidentally clicking on 'ignore' and not knowing what happened. I have a highly customzed forum theme and I want to replace "Ignore" button to link. Could you fix it in the next update?